Manufacturer of a wide range of products which include wireless remote controlled hooter / alarm for railway safety application. DESCRIPTION This system consists of 2 units. One is Master(Smaller Box) & other One is Slave(Bigger Box, having Hooter). Each Unit will communicate, transmit alarm signal & send feedback of the same to it's matched counter part even when they are kept at 1.2Km. apart.Function Once the Matched Master & Slave Units are switched on, they take few seconds of link up each other. Once the link is established, both the unit gives healthy link status by intermitatnt glowing of Comm. On indicator & Buzzer sound . If unmatched Master & Slave are switched on, or if the matched panels are taken out of range from each other, then Link will not establish or fail.Users can press the Hooter On (Red) Push button at front panel of Master Panel. It will make the Hooter sound at Slave Panel with Indication of Hooter On. Occurrence of this event will be ensured to the Master panel by glowing it's glowing it's Hooter On Indicator. In such case , Slave panel's hooter can not be switched of from the Master panel. 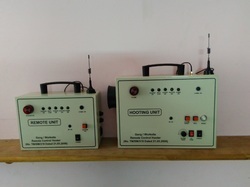 To switch of the Hooter, user need to reset the Slave panel by Pressing Reset button .To keep the user of Slave unit Alart, Alartness Sound will occur from Buzzer of Slave Unit after each interval (2~15 min ) as per usr setting of Alarm Timer Knob. This Alarm sound can be resetted by pressing Alarm Reset Push Button. Looking for Wireless Remote Controlled Hooter System ?